In the FY 2012 the Optical Neuroimaging Unit completed the lab setup with two two-photon setups for in vivo imaging. 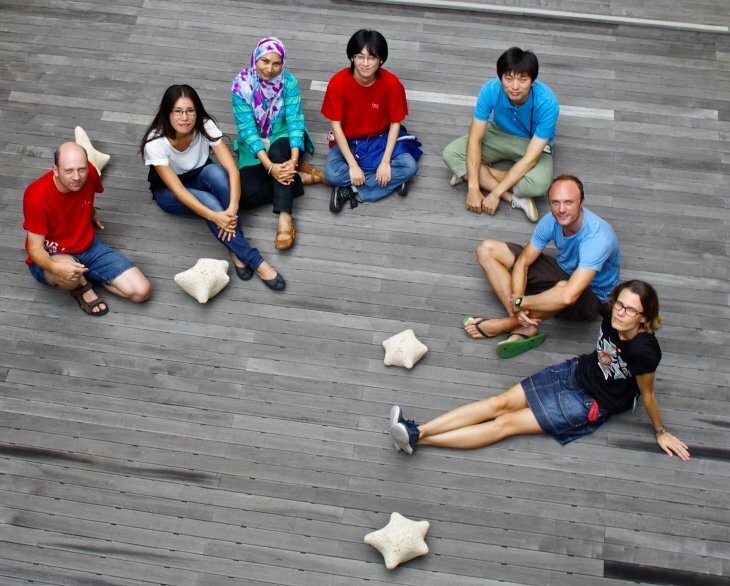 Research projects started focusing on imaging neuronal activity in vivo. In the FY2012 we finalized the setup process for in vitro and in vivo brain imaging. We optimized surgical procedures and imaging techniques. We focus on barrel cortex. 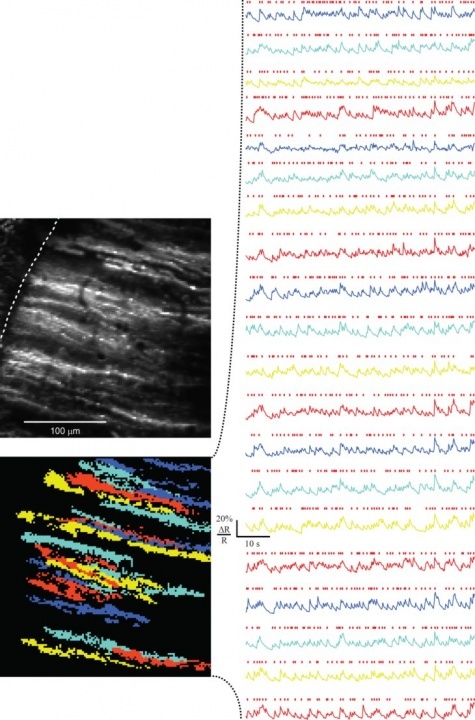 Recording of identified neuronal network activity using genetically encoded calcium indicators (GECIs) requires labeling that is cell type-specific and bright enough for the detection of functional signals. However, specificity and strong expression are often not easily achieved using the same promoter. Here we present an inducible combinatorial approach for targeted expression and single-cell-level quantification in which a specific weak promoter is used to drive trans-amplification under a strong general promoter. We demonstrated this approach using recombinant adeno-associated viruses (rAAVs) to deliver the sequence of the GECI D3cpv in the mouse cerebellar cortex. Direct expression under the human synapsin promoter (hSYN) led to high levels of expression (50-100 µM) in all five interneuron types of the cerebellar cortex but not in Purkinje cells (PCs) (~10 μM), yielding sufficient contrast to allow functional signals to be recorded from somata and processes in awake animals using two-photon microscopy. When the hSYN promoter was used to drive expression of the tetracycline transactivator (tTA), a second rAAV containing the bidirectional TET promoter (Ptetbi) could drive strong D3cpv expression in PCs (~100 µM), enough to allow reliable complex spike detection in the dendritic arbor. An amplified approach should be of use in monitoring neural processing in selected cell types and to boost expression of optogenetic probes. Additionally, we overcome cell toxicity associated with local GECI overexpression by combining the virus injection with systemic pre-injection of hyperosmotic D-mannitol, and by this double the time window for functional imaging. Figure: Cerebellar interneurons like Lugaro (left) and Golgi (right) cells can be specifically labeled and used for functional imaging in vivo with genetically encoded calcium indicators by using the human synapsin promoter. Figure: Cerebellar Purkinje cells can be specifically labeled and used for functional imaging in vivo with genetically encoded calcium indicators by using thethe TET promoter system. Figure: Functional imaging of dendrites of cerebellar Purkinje cell in awake mice. The pH is one of the key parameters governing protein conformation and activity. In protein crystals, however, the pH is so far not accessible by experiment. Here, we report on the optical detection of the pH in a lysozyme crystal employing the pH-sensitive fluorescent dyes SNARF-1 and SNARF-4F. The molecular probes were loaded into the crystal by diffusion. Two-dimensional fluorescence spectra of the labeled protein crystal were recorded and the average pH of the crystal at different bath pH was determined by calibrating fluorescence peak ratios. In addition, we used two-photon microscopy to spatially resolve the pH inside a lysozyme crystal three-dimensionally and to follow pH changes in response to a pH change of the bath over time. At equilibrium at bath pH between 5.5 and 8.0 we found a pH in the water-filled crystal channels that was DpH = -0.3 to -1.0 lower than that of the bath. This corresponds to a 2 to 10-fold higher proton concentration in the crystal channels than in the bath. The lower pH at equilibrium in the crystal channels can be explained by slower proton diffusion in the channels than in the bath and a resulting proton accumulation in the crystal for conservation of mass and so an equilibrium of flux. Figure: The pH sensitive fluorescent dye NARF-1 (center) brightly labels lysozym crystals (left) and allowas us to measure pH and pH changes in the crystal (right). Calcium is an important second messenger in neurons and an increased calcium concentration is correlated with neuronal activity. For this reason we use a genetically encoded calcium indicator, called G-CaMP, in secondary motor cortex (M2) of mice to detect neuronal activity. 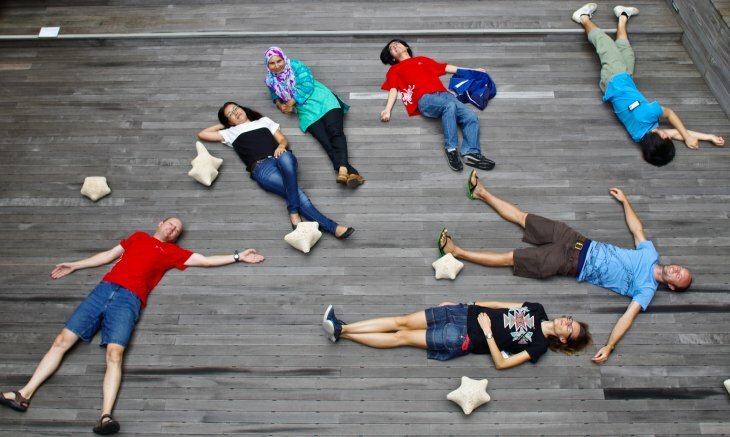 When a neuron becomes active, G-CaMP will become brighter. Figures show the two-photon image of neurons labeled with G-CaMP in an anesthetized mouse, indicating that neurons in layer 2/3 were successfully labeled. In preliminary experiments we conducted a simple Pavlovian conditioning task and functionally imaged neuronal activity in awake behaving mice. In this task, mice get a water reward after a tone presentation. We found that layer 2/3 neurons in M2 showed correlated activities with tones, licking, and locomotion, and that such characterized neurons were homogeneously distributed in space. 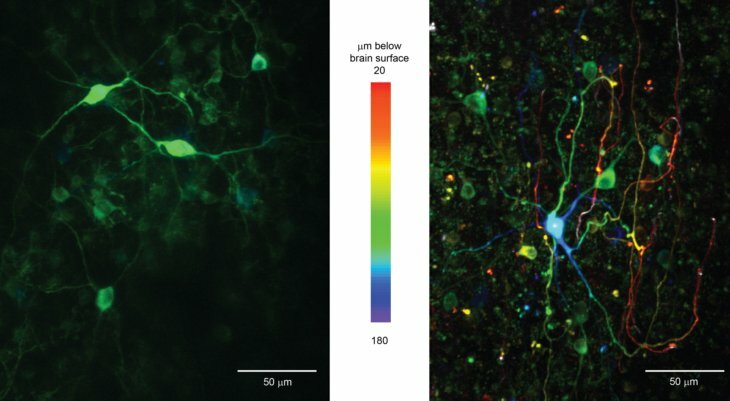 Figure: In vivo imaging of neurons with two-photon microscopy. Images show layer 2/3 neurons through a chronic cranial window in the xy plane (A, i - iii) at different depth below the brain surface and a reconstructed view of the xz plane (B). We image the lavae of ascidians with two-photon microscopy. This allows us to get higher resolution than with confocal microscopy due to lower scattering artefacts. We studied dendritic signal processing in TC neurons with combined two-photon calcium imaging and somatic whole-cell recording of responses to local dendritic glutamate stimulation. In an independent project Shiwei Huang (Computational Neuroscience Unit) and Marylka Y. Uusisaari work on brain dissection and slicing using solutions warmed to near-physiological temperature (~ +34°C). This greatly enhances slice quality without affecting intrinsic electrophysiological properties of the neurons. Improved slice quality is seen not only when using young (<1 month), but also mature (>2.5 month) mice. This allows easy in vitro patch-clamp experimentation using adult deep cerebellar nuclear slices, which until now have been considered very difficult. As proof of the concept, they compare intrinsic properties of cerebellar nuclear neurons in juvenile (<1 month) and adult (up to 7 months) mice, and confirm that no significant developmental changes occur after the fourth postnatal week. The enhanced quality of brain slices from old animals facilitates experimentation on age-related disorders as well as optogenetic studies requiring long transfection periods.